What was the connection of Blue Cheer with Pinnacle Rock Concerts? I learned some very interesting facts today about the connection of 1960s psychedelic rock band Blue Cheer with Pinnacle Rock Concerts. 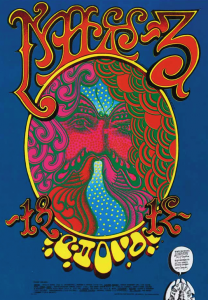 Pinnacle Rock Concerts (or Pinnacle Productions) put on many shows at the Shrine Auditorium and adjacent Exhibition Hall in Los Angeles California in the 60s. It looks like they were most influential in exposing Blue Cheer to the public. As a matter of fact, Blue Cheer (Dickie Peterson, Paul Whaley and Leigh Stephens) did the first Pinnacle Concert at the Shrine Auditorium along with Jimi Hendrix and The Electric Flag. From what I see, Pinnacle Productions promoted many bands that would otherwise may not have been seen or heard of. Actually, I was doing some research on artist John Van Hamersveld and discovered he was one of the founding partners of Pinnacle Rock Concerts. You may not know the name immediately, but you know his art. He did the Endless Summer movie poster and The Beatles – Magical Mystery Tour album cover. Both, very iconic. Van Hamersveld knew Allen “Gut” Turk, Blue Cheer’s manager. He was working on an album cover design and asked Van Hamersveld to photograph the band. 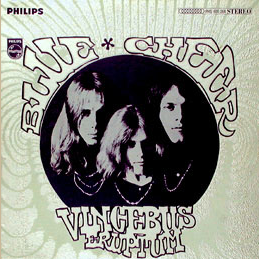 That was Blue Cheer’s first album (Vincebus Eruptum). It was a huge success and the award winning cover is still recognizable and an iconic image from the 60s. So for the first time I’m seeing a San Francisco based band playing in Los Angeles on a lot. it seems. The combination of Blue Cheer with Pinnacle Rock Concerts at the Shrine Stadium were obviously very popular. 4,000 strong they would storm the gates. I’m not from California and am just discovering these Pinnacle Production concerts. 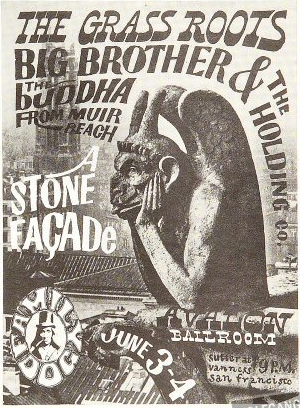 Of course, I had heard about the famous Shrine Auditorium, but didn’t realize they promoted rock concerts in the 1960s. Strangely, there were not a lot of rock art posters being done in Los Angeles. It looks like Van Hamersveld did most or allot of the posters for the Pinnacle Rock Concerts (an obvious choice) and shrine Auditorium promotions. But, they are arguably some of the best of the genre. The Blue Cheer band was very, VERY loud (maybe the loudest) and possibly abrasive/abusive onstage. More than once getting into tussles with other bands on the same bill, like the Grateful Dead and the Jeff Beck Group. Nonetheless, they are attributed to being the godfathers of metal music or the beginings of heavy rock. At the time it was just very original and experimental music they were doing. What was the connection of Blue Cheer with Pinnacle Rock Concerts? (I believe) they were destined to be partners. Gut Turk, Van Hamersveld and the other managers saw them (Blue Cheer) as innovators and way ahead of their time. As you might imagine from this post, yes I was a fan back in the day and I would say, still am today. It was some of the most animal, raw, unbridled and original rock ‘n roll I had ever heard. Liberating. Also, the relationship of Blue Cheer with Pinnacle is relevant to this blog. Because it is believed to have been born from the collaboration of an album cover design no less. “Vincebus Eruptum” (pronounced ‘win-kay-bus’) is Latin for “Conquering Attack” or “Conquering Explosion.” It’s the best translation I could find. Dickie Peterson (however) defined it as”control of chaos” or “controlled chaos” on a Blue Cheer appearance of the Steve Allen Show. The answer to the question is… not many! If you’ve seen the movie “Saint Misbehavin’: the Wavy Gravy Movie”– you know what I mean. 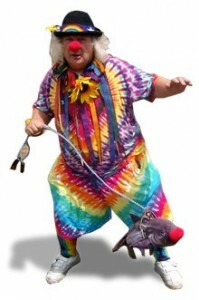 Wavy Gravy (Hugh Romney) is an activist and defender of peace, basic human needs and humanitarian causes. He spread the word around the world in a group called The Hog Farm dressed as a juggler, a clown in a caravan of psychedelic painted buses in the 1960s. As a matter of fact he wrote the song called “Basic Human Needs” (the existence of certain universal needs that must be satisfied if people are to prevent or resolve destructive conflicts – International Journal Of Peace). Wavy Gravy was always an apostle of peace and love and still is to this day. He also works very hard at it. Wavy says, “some people tell me I’m a saint, I tell them I am a saint misbehavin’”. Hugh Romney (Wavy Gravy) was born in East Greenbush, New York and grew up in Princeton New Jersey. He would take walks with Albert Einstein, be roommates with Bob Dylan (while writing A Hard Rains Gonna Fall) and become a beat poet in Greenwich Village. He became the poetry director at the Gaslight Café (New York City) and was instrumental in introducing jazz and poetry there. He was so popular he began opening up for acts such as John Coletrane, Thelonious Monk, Peter, Paul, and Mary plus many others. At some point Wavy becomes part of an improvisational group from San Francisco called “The Committee”. He and his wife Bonnie Jean are living outside of Los Angeles in 1965 when a neighbor (recovering from a stroke) offered a mountaintop spread rent-free in exchange for slopping the hogs. Thus was born The Hog Farm commune and will be Wavy Gravy’s headquarters for everything else to come. There would be many humanitarian bus tours, tours with Ken Kesey & the Merry Pranksters, also an MC and member of the support crew “The Please Force” at Woodstock along with The Hog Farm. All in all, the movie covers his life and work pretty thoroughly (including iconic friends and colleagues from the 1960s). I came away feeling that this was a very good man and serious about making the world a more happy, safe and peaceful place to be in. It is also a history lesson about how the 60s really did change the world and we feel it still today. The scope of his goodness is much more than can be covered in this post. If you’ve never heard of Wavy Gravy or are interested in learning more, it will be well worth your time to see what’s behind this cosmic clown and all that he’s done. Pretty fascinating. How did the Griffin Moscoso Collaborations come about? There were many Griffin Moscoso collaborations. 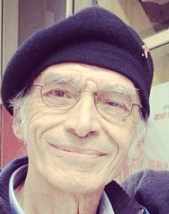 Victor Moscoso ran into Rick Griffin for the first time in the Spring of 1967. He saw what looked like “Jesus Christ with a portfolio in his lap” at The Family Dog offices where he was picking up a check that day. Their first meeting was magical. Griffin had come over to Moscoso’s house with a layout of lettering around an oval shape. he needed collaboration on what would go inside the oval and how to finish the piece. Moscoso traced and used Griffins face in the oval shape, but his features are made of butterflies, peacocks and stars. 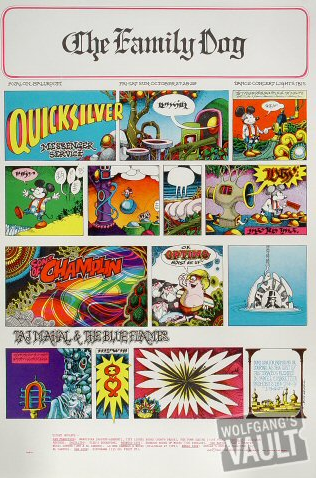 According to Moscoso, he and Rick Griffin worked on six posters together and they were all good. (I do not doubt that with the caliber of talent here). They would do them all at the same time and the same place. Many Griffin Moscoso collaborations would consist of what they called “jams”. This was taken from “jam sessions” where musicians trade licks with other musicians. This seems to have been a very rewarding and fun partnership. “Neither Rick nor I ever did anything that we didn’t want to do” – VM. They often would be able to solve each others problems. Working with complicated graphic processes with the printer (at least to this author), one of them would come up with something perfect to complete the others creation. “Not only is it a perfect solution, but it’s a surprise, because it’s coming from another mind.” says Moscoso. I say it again, the Griffin Moscoso collaborations were phenominal. they carried this union on into their work at Zap Comix. But, I want to explore some of the creative process on their individual posters and also their work at Zap Comix…maybe in another post on underground cartoonist R. Crumb. When Did Moscosos Comic Books Begin? 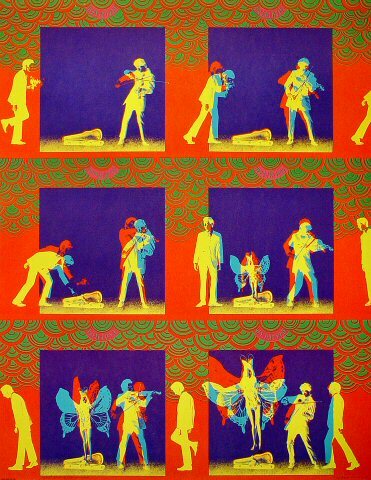 With our theme on psychedelic artistes, it is noteworthy that Victor Moscoso’s (famous rock posters artist) streetwise upbringing in Brooklyn gave him a no-nonsense type of approach to art and art projects. He takes a very practical view of commissioned assignments and personal projects. Lucky for us! I believe this led to many projects and encompassed a wide range of work he may have not discovered. This may include (but not limited to) his work and leadership at Zap Comix and other Moscosos comic books. This image to the left is the very first Zap Comix Book. Launch date was March 1968 and the brain child of legendary underground comics artist Robert Crumb (R.Crumb). Crumb would recruit other artists S. Clay Wilson, Robert Williams, “Spain” Rodriguez, Gilbert Shelton, Victor Moscoso and Rick Griffin to collaborate with him. The latter two with reputations as psychedelic poster designers, in their own right. They would all come on board as the new roster of artists for Zap Comix. Moscoso and Griffin worked well as partners on many poster designs and projects. Griffin had actually made his bones doing a surfer comic strip “Murphy” in 1961 and started germinating the idea of doing comics with Moscoso, before Zap was published. It is claimed that the term “comiX” (with an X) refers to the traditional comic book style of Zap, and its mixture of dirty jokes and story-lines. Moscosos comic books (Zap Comix included), were more of an an illusory / optical type of art. But, “Crumb and Griffin took the taboos straight on” as Moscoso puts it. The comic books were labeled “Fair Warning: For Adult Intellectuals Only”. This was soon to be taken very literally, as this obviously was not a kiddies comic book. So bad, that in some places you could not buy this over the counter. This made the comic even more coveted and wildly popular. 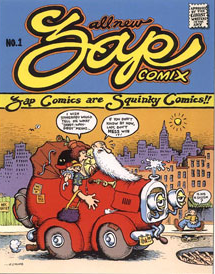 Zap#4 was most infamous as it depicted an R. Crumb story “Joe Blow”. It was about a incestuous All-American nuclear family . Their motto being “the family that lays together stays together”. Numerous “community standards” obscenity busts and court cases were brought against the publisher Print Mint. This was actually was banned in New York from over the counter sales. According to Moscoso – R. Crumb had been a super fan of he and Rick Griffin and after seeing poster Family Dog #89 an imitation of the Sunday Chronicle pages. After seeing that he went home and created Zap Comix. They were in essence his heros. That is actually a very interesting time line and important info. All of these guys were so famous, many times you dont know who came first. But, to answer the question to our post – When Did Moscosos Comic Books Begin? I would have to say not in the FIRST issue of Zap Comix. But, as we revealed earlier, obviusly a Moscoso/Griffin poster was the inspiration. It would probably be the second issue moving forward to this day. Moscoso was heavily involved in the comic even in distribution and management. He was instrumental (IMHO) in making Zap Comix the phenomenon that it is. Does that title bring to mind a guy with formal academic training @ Cooper Union, NY – Yale – SF Art Institute and taught there as well? Meet rock concert artist Victor Moscoso. 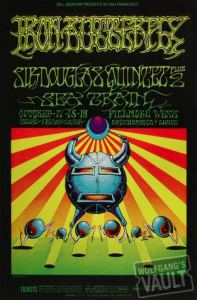 We’ll wax endearingly about all of the classic -golden era rock concert poster artists (Wes Wilson, Stanley “Mouse”, Alton Kelley, Rick Griffin and more) but, Moscoso was the exception to the rule. It does not come down to a matter of style or who’s the better artist or possibly who had more experience – that is all relative to the viewers style and taste. We are talking strictly about formal education in art. Now, this was a good thing and a bad thing as it turned out. According to him -the structure and rules of his formal art education had to be torn down and rewired in order to experience the freedom he needed to excel in poster art. Wow! Artist sacrifices for his art, yet again. This is amazing to me. I have been an admirer of cartoonist, artist, teacher and rock concert artist Victor Moscoso for many, many, years. Now, to discover the struggle and reversing of academic knowledge just to do rock concert posters…sounds pretty incredible now. But really, it goes perfect with the 1960s mentality. Being experimental, being free, and liberating (I think were his words) were the direction & expression of art, music, and the counter culture itself. I’ll give you a couple of quotes here that I feel are relevant and capture the essence of this era and comment on fine art vs. commercial art. Growing up in Brooklyn comes with street smarts and Victor was no exception to the rule. After much training and school…”On The Road” – Jack Kerouac was published in 1959 he was compelled to move west to California. Well that is a brief introduction to our featured rock concert artist Victor Moscoso. Next up: more about his history, artistic heritage, accolades and what made his rock posters stand out from the rest. Well, the latest news on this Rose Bowl Rock Poster is the seller decided to take one auction it off on Ebay. it sold and made a pretty good return at $52.66 I believe. If you remember this particular seller bought 30 of these American Music Show Handbills at an estate sale recently. He had sent me some images and info (as much as he could) on the piece to see if I could could come up with an appraised value. If you look at many of these Rose Bowl Rock Poster designs – whether it is full posters, handbills, or post cards (which were the printed pieces of choice to promote the concerts) you get a certain feel for the value. Handbills (unless very rare) are usually in the $50.00 range. This is a beautiful 8 X 4 mint condition card by artists VanHamersveld and Schnef and a very nice affordable collectors piece. If you are interested in purchasing one of these you can keep an eye out on Ebay as they will possibly be showing up time to time. Or you may shoot us an email and I can put you in direct contact with the seller. This was an interesting quote, because I just read in “The West of Center: Art and The Counter Culture Experiment in America, 1965-1977” that this Rose Bowl concert was not well attended. As a result Pinnacle (Three partners known as Pinacle Rock Conerts) failed financially and the Shrine Concerts ended. Many of the Pinnacle Shows were at the Shrine Auditorium. Also, John Van Hamersveld (one of the artists on this piece) was in fact one of the founding partners in Pinnacle Rock Concerts. This Rose Bowl Rock Poster was co-designed by Bob Schnepf and John Van Hamersfeld. 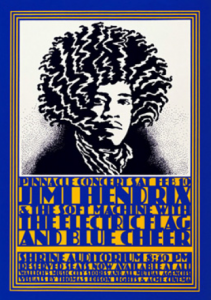 Concert poster design certainly did not originate in the 1960’s. But , I would say that between the years 1955-1971 were the golden years of famous rock concert posters. Early on (if your old enough to remember) posters for events such as wrestling, boxing and musical events were very mundane and predictable. They were usually just a 2 color printing job and plastered on telephone poles near stop lights. 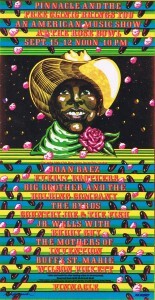 For the times, this type of concert poster design was exciting and caught your eye. Very bold and you got the message quick. However, if you compare the posters of music, sports, and other events of the time…they all had a similar formula. Also, they were cheap to produce. Therefore you could print in high quantity to get the message out. Most of them had this same look and feel as the James Brown poster featured here. I have a sentimental feeling for these type of posters (from a graphics artist /historical viewpoint). But, when you realize the multitude of posters produced with the same elements it was over kill and kind of boring after a while. These type of 2-3 color events posters were produced mainly in the 1950’s. Concert poster design would get turned on it’s ear during the next decade. No more restrictions on color – no more stamped out clones of posters. There will be a revolution of art and music coming in the 60’s. The type of original music created (mainly to compete with the British Invasion, a la “The Beatles”) would bring a new creative and colorful posters to represent it. Also, notable artists, cartoonists and graphics people were on board for this art explosion. Speaking of which, i just had a nice hand bill sent to me for apprasial. Wow, it is nice. I cant say that ive ever seen this particular piece for “An American Music Show At The Rose Bowl” I can tell you it must have been some event in 1968 with the muscial line up that was presented. Joan Baez, The Byrds, Big Brother & The Holding Co. – the list goes on and on. This looks to be from an underground cartoonist to me. But, I cant place it. Anyone have a clue? If you have any info on this postcard/handbill or this event send me something back on it. I am currently doing some research on this concert poster design and would welcome some advice info or help.